The Pipeline Panel lets you track how many of your sent proposals are being accepted by your leads and existing clients. All data shown in the Pipeline Panel is only for the last 30 days. 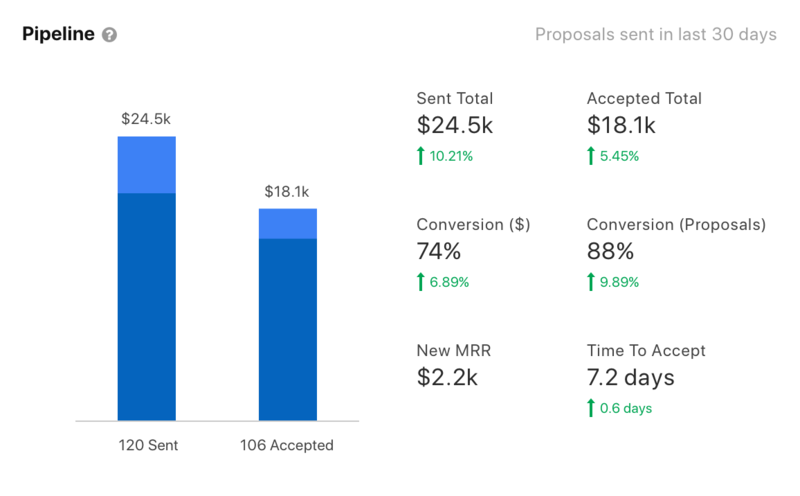 Over 95% of accepted proposals are signed within 30 days of sending, so this timeframe gives a good sense of how well you are converting new opportunities into new business. The pipeline also provides a comparison to the previous 30 day period. This shows you how the last 30 days is tracking compared to the previous period (30 to 60 days ago). The graph lets you visually compare the value of proposals sent, against the value of proposals accepted. Each bar shows the mix of recurring (dark blue) and project (light blue) work that has been sent or accepted. By hovering over the bar with the mouse, you can drill into details of the precise numbers for project and recurring work. What is the total value of a proposal? This is the sum of all the fixed price work in the proposal. For example, consider a proposal which will charge $500 when accepted and $200 each month for 10 months. The total value of this proposal is $2500. This is calculated as: $500 + ($200 × 10). Estimates are excluded from this total. This is because their exact value won't be known until the client is billed. What is meant by project or recurring work? Recurring work is billed to your client as an ongoing monthly fee until the end date of the proposal. Project work is billed to your client as a one off fee. In a proposal, any service with the billing type set to "Recurring" will count as recurring work. Anything else is considered project work. How are lost, revoked and adjusted proposals displayed? Practice Ignition allows you to mark proposals as lost to indicate that you no longer expect them to be accepted. Any lost proposals are simply part of the drop-off that occurs between sent and accepted. 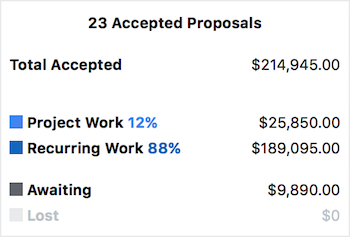 You can see the total value of lost proposals and those that are still awaiting acceptance, by hovering over the accept bar on the graph. If you have revoked a proposal, it will be removed from the pipeline. In other words, the number and value of sent proposals will go down. This means that any proposals sent in error won't inadvertently contribute to your pipeline figures. When you adjust an existing active proposal, the pipeline will not show any data for the new adjusted proposal. The original proposal will still be shown in the pipeline if it was sent within the last 30 days. Why aren't my proposals showing up in the pipeline? As stated above, revoked and adjusted proposals will not show in the pipeline. In addition, only proposal where you have used the send to client action will show in the pipeline. This means if you use the move to awaiting acceptance action, these proposals will not be displayed as they were not sent by Practice Ignition and therefore do not have a 'sent date'. The sum of the total values of all proposals sent in the last 30 days. The sum of the total values of all proposals sent and accepted in the last 30 days. This is the new monthly recurring revenue that has been added by proposals sent and accepted in the last 30 days. A more detailed description of MRR is available on the Revenue Panel help page. This answers the question "How long, on average, do clients take to accept my proposals?". This is the median time from the proposal being sent to being accepted, for all proposals sent and accepted in the last 30 days. Any proposals accepted on behalf of your clients are excluded from this calculation.